TeenPact, an organization dedicated to helping young people grow in leadership, knowledge of political processes, and faith, recently announced that their program is expanding to its 41st state: New York. Many classes are offered by TeenPact, including the Four-Day State classes, which can now be taken in 41 states. 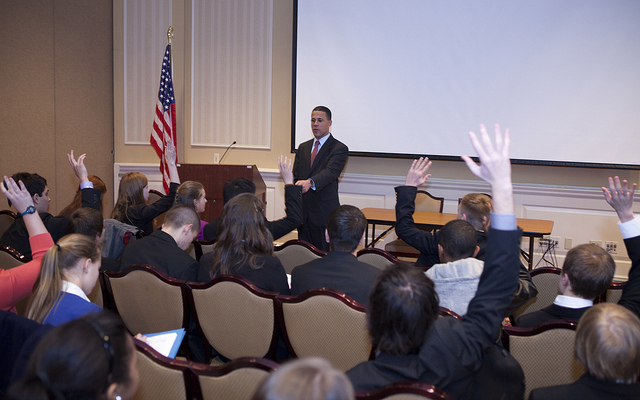 The State classes for 13-19 year olds include tours of the State’s Capitol; inspiring conservative political speakers; worship (often at or even in the Capitol); prayer walks; focused individual and group exercises that increase students’ understanding of public speaking, the political process, and the legislature; and more. The activity most often reported as students’ favorite is TeenPact mock legislature. Additional classes offered in individual states include the Political Communication Workshop, which focuses on speaking and diplomacy skills, and the One-Day class for 8-12 year olds, which is a condensed and age-appropriate version of the Four-Day class. After students have taken a State class, they become eligible for many amazing alumni classes, including Back to DC, Judicial, National Convention, Congress, Venture (for boys), Endeavor (for girls), and Survival. Alumni are also eligible to apply to staff state classes, write an essay to compete for a scholarship to an alumni class, and return to their State classes as alumni for exciting new adventures. Leadership and Christian discipleship are taught in the context of good citizenship, politics, and government at all the TeenPact State and alumni classes. As the Oregon State Coordinator, Nancy Bennett is quick to affirm that TeenPact’s classes leave a long-lasting impact on many of the participants. Bennett has been involved since 2006, when her children took the TeenPact One-Day class. She said she heard about it in a homeschool newsletter and decided to sign her children up after hearing great things about the classes from another homeschooling family. Bennett’s multitude of tasks as State Coordinator include securing facilities for the class and the new residential camp (that just began last year), finding housing for the interns and staff, planning meals, promoting the class, and delegating tasks such as inviting speakers to student assistants. “I also watch registrations, make sure we have enough participants, establish relationships with the businesses we work with, and figure out what we need and what it will cost,” she said. “The commitment in the hearts of the staff—paid and volunteer—is incredible,” she said.